Macroeconomic troubles have prompted Zenith to lower its global ad-spend growth prediction to 4% for 2017. Total expenditures are now expected to reach $558 billion. That’s a downgrade from the 4.2% growth that Zenith had forecast in June. The June forecast was a downgrade from the 4.4% the Publicis Groupe media agency had forecast in March. "I was surprised to downgrade so many Eurozone ad markets, since the region is currently enjoying its best economic performance for a decade," says Jonathan Barnard, the agency’s head of forecasting and director of global intelligence. There are also pockets of weakness in Mexico and Thailand, while Malaysia’s recovery from a 2016 downturn is taking longer than expected. These disappointments have been partially offset by improvements in Canada and Russia. For now, Zenith projects that global ad expenditure will hit 4.2% in 2018. Although some persistent uncertainty remains in the U.S. marketplace -- particularly with regard to policy changes the Trump Administration may or may not implement -- advertising is forecast to increase 3.5% in 2017 to $434.5 billion. That's roughly in line with earlier predictions for the year. Next year, the U.S. market’s growth is expected to hit 3.4%, per Zenith's latest forecast. Digital -- and particularly mobile -- continues to take dollars away from print media as consumers use mobile apps. The most rapid growth is coming from online video (+18%) and social media (+25%), while U.S. TV is still growing, only fractionally at 0.5% this year. American print media continue its steep decline, with newspapers falling 9% and magazines down 7.4% this year. Globally, social media -- growing at 20% per year -- and online video -- growing at 21% per year -- are driving 14% annual growth in total display advertising, according to the updated forecasts. 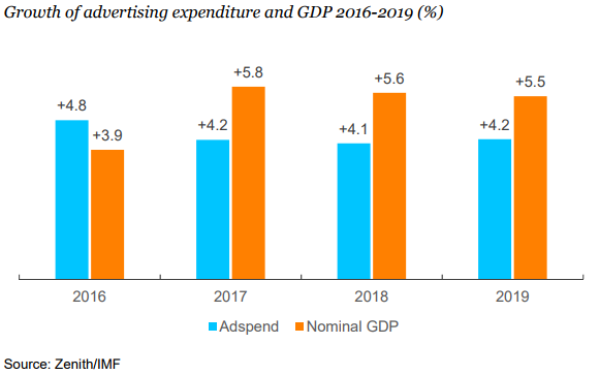 Total display expenditure will increase from $84 billion in 2016 to $126 billion in 2019, accounting for 64% of all the growth in global ad expenditure. By 2019, total display will account for 50.4% of internet advertising expenditure, exceeding 50% for the first time. "Online video and social media advertising are growing the fastest because that's where consumer attention is moving to, and where advertisers can reach otherwise hard-to-find audiences with great results," says Barnard,. "If that's where your target audience is, you need to be there, too." Combined ad spend on the complementary TV and online video platforms continues to grow, accounting for 48.5% of brand ad spend in 2016, and forecast to rise to 49.3% in 2019. “But the distinctions between online video and traditional television are being eroded, and the two work together much better than they do separately," says Barnard. Zenith, to that end, distinguishes between television and online video advertising because they are distributed differently, generally sold differently and categorized differently by third-party agencies that monitor advertising expenditure, says the agency. But for many consumers, they are beginning to blur together as smart TVs and other devices deliver internet content to households' main TV sets. Paid search will reach $103 billion by 2019. And some promising opportunities remain for this category. Much of its recent growth has come from innovations in mobile and location-based search. Future growth will come from adapting search ads to voice-activated personal assistants like Siri and Alexa, says Zenith. Classified advertising -- advertising on dedicated web pages without editorial content, often for cars, house and jobs -- was an important part of the early internet. But its share of total internet expenditure has been shrinking for many years as users have turned to free listings, auction sites and other substitutes. In 2016, advertisers spent $17 billion on internet classifieds, and Zenith expects this total to rise by just 7% a year to $21 billion in 2019.